Using quadratic regression equations to predict the outcome of a basketball shot. Lesson plan/worksheets created by Mrs Bortz, Ms Goulbourne, Mrs Carter, International School of Dusseldorf. The task is to find a mathematical model of the path of the ball in order to check if the ball will enter the basket successfully. Students must communicate the process and evaluation of the mathematical model in a typed report. This activity (lesson flow) assumes that prior teaching has covered Quadratic and Linear Regression Equations. This activity is a Summative assessment which requires the students to apply the above techniques to a real life situation (Basketball Shot). What the students may need help with is how to use the computer based graphing calculator TI-84, which can be downloaded using a 90 day trial from the attached link. The other link takes students/teachers through a step by step process of how to find the values of a quadratic regression equation. 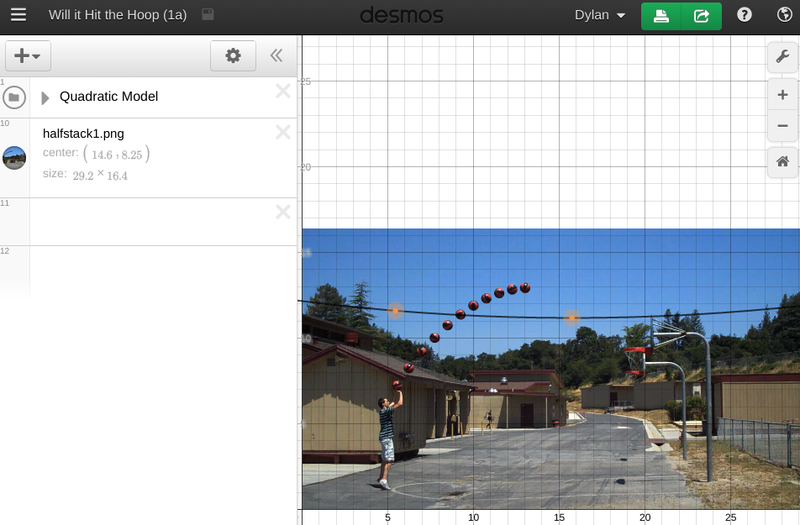 This summative assessment task requires the students to take coordinates (from Desmos, see image below), apply to a quadratic regression equation (using the T-84 Emulator), and then make predictions as to whether or not the shot will make it to the basket.